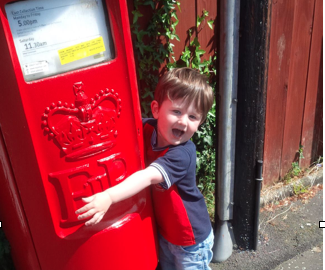 In February 2016, Reuben and I, headed to the post box to send our Open Letter to the Department of Health, regarding Perinatal Mental Health Service, in Northern Ireland. I’ve been sitting back this week thinking over the last year and ALL that has happened and ended up back with the Letter. WOW!!! So much has gone on, I didn’t realise it until now that I have slowed down for a second. Started Have you seen that girl? which has a good following and readership now. Written for newspapers, magazines and publications. Campaigning at Westminster (meeting MP’s and Senior Decisions Makers) and at Stormont (with MLA’s and Senior Officials). Delivered a Ted Talk – What If Motherhood Is Not The Time Of Your Life? Spoken in a debate/event in Westminster about PMH. 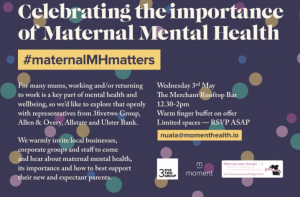 Joined the Maternal Mental Health Alliance and I am also now employed a day every week as their Everyone’s Business Co-Ordinator for Northern Ireland. Created, designed, fundraised and secured sponsorship for “Bags of Hope” – which have been delivered to 500 parents so far, with 1000+ still to get to parents in NI, over the next year! WOW! I do not say that in any way to try to promote myself – sorry if it seems that way. I guess, more than anything, I want to offer it as an encouragement to others, who are struggling. Two years ago I wanted to give up on life altogether – “I want to die” & “Lock me in a room and never come back for me” where constants from my lips. I had no hope, I hated myself, was ashamed of my life and felt huge guilt and blame for the mother I thought I wasn’t. But that wasn’t the end. When I finally got diagnosed and treatment, I started to recover. I am on a journey to wellness now. I want you to know that there is hope – no matter how dark the day & night might seem – please do not give up. But this is not just about me, Have you seen that girl? is about so much more. Yes, at the minute it’s “just me” behind it practically… that might have to change! But there are so many of YOU who have made it what it is – thank you! Myself, Have you seen that girl? 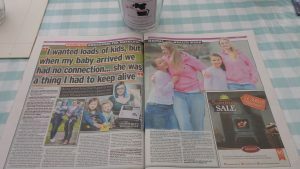 and many other local parents have been ALL OVER the NI media this past year, openly taking and sharing our stories. It’s fantastic. Also, 83 (83!!!!) 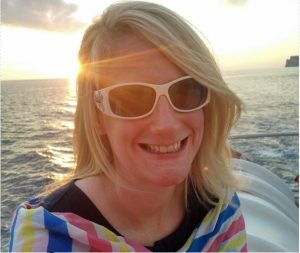 other mums have shared their stories, on the website – WOW! What a list – we are really getting OUR message out there! Have you seen that girl? has worked closely with the RQIA and their review into PMH services. Many mums and parents also shared their thoughts and opinions. The report is now published and in May 2017 we held an event in Belfast City Hall, to push forward what we know needs to happen and happen soon. It was a fantastic! Many passionate people joined us and the community who are behind the issue are an inspiration. Many more to come – you can get me at haveyouseenthatgirl@outlook.com if you want to talk! 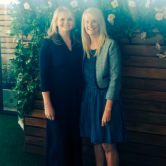 Last year, on World Maternal Mental Health Day, I met Nuala Murphy on Twitter and heard about her dream, vision, plan & goal to develop a technology company to tackle Perinatal Mental Health. We have become firm friends and I am very thankful for her. I am delighted to say that she is on the path to achieving all of that, read more HERE. We have teamed up for many things including #TimeForChangeNI. You can follow Nuala’s work here on Facebook & Twitter and on the Website – please do! There is no one ‘go to’ place where you can find information on the help and support for PMH. For example, a website that provided details of all types of organisations that offered support and resources by area, would be very welcomed by mums. Having centralised information would mean that everyone could have access to the same details and could be informed of all the options. 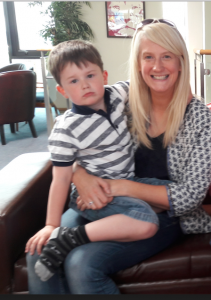 Nuala is actually bringing all this information to the website and app, which will mean that mums & dads can easily access the information and help they need. 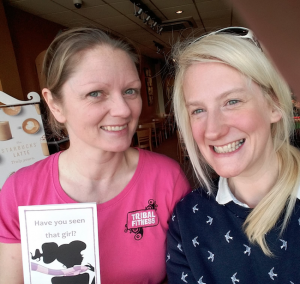 Amazing Nuala – Have you seen that girl? is right behind you and will give any help you need. 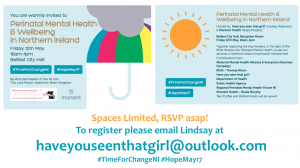 This year, on World Maternal Mental Health Awareness Day (3rd May), Moment Health & Have you seen that girl? hosted an event in the Merchant Hotel, Belfast. We wanted to begin to address the issue of mums (and dads) becoming parents and returning to work. The turn out was double what we expected and a fantastic opportunity to engage, share learning and highlight PMH in AMAZING venue! Returning to work has also been a big issue for mums, who have recovered or are recovering from PMH issues. Many felt that employers had no concept of the issues they were facing and made no attempt to accommodate or make their return simpler. It seems there could be more support available when struggling mums are returning to employment. From listening to stories, I would go as far as to suggest that many mums end up not working, as their return has been so difficult. Surely this is not what we want and is not in the best interest of anyone in our society? A campaign, to raise awareness of PMH in general, would go a long way to help with this. We fully accept that one event will not “fix” this issue and nor can we… but we were delighted to begin the conversation and are planning to continue it to by offering practical solutions and training – watch this space! In the Open Letter, I suggested that HCP’s needed additional information, training and support on how to deal with and provide treatment for struggling parents. The RQIA report also confirmed that and official plans will hopefully be put in place. But, over the last year Have you seen that girl? has been delighted to be invited to speak, share and train HCP’s about PMH – from my own experience and also from all the knowledge you have shared and lended to me. 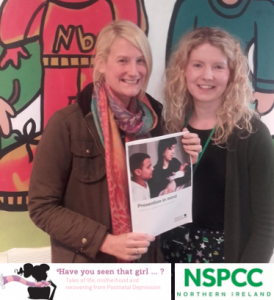 The NSPCC, with the Royal College of Midwives, are currently undertaking a survey too and it was lovely to be asked to review that with them before it went live. It’s been great to build up a network and be welcomed to work alongside all our dedicated HCP’s – we are all in this together – and we thank them for want they do. PHEW! Can you believe it? Look at all we have achieved! I don’t believe that the responsibility for moving our services forward lies with one person, one department or one organisation. We can all have a part to play, I am delighted, today, to be well enough to play mine. Where do we go from here? Oh… wait and see! There’s so much more to do and so much more to come! Come join us and be part of this with us… we need you. ← Pramble fundraiser for Bags of Hope! Incredible work! Well done Lindsay & Nuala! Excited to see what your next year will involve!